I love writing Book Raves. I find ranting about something I like is much more enjoyable than ranting about something I hate. Today's Book Rave is going to be on the first installment of a comic series I just started. I've only finished the first volume, but I can already tell it's going to be an amazing ride. 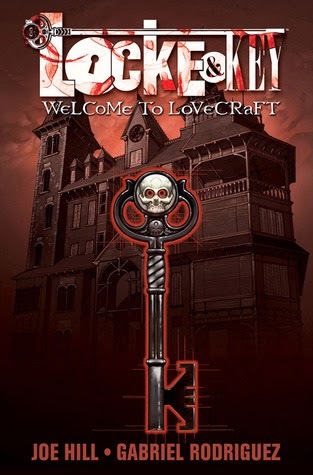 "Locke & Key tells of Keyhouse, an unlikely New England mansion, with fantastic doors that transform all who dare to walk through them. Home to a hate-filled and relentless creature that will not rest until it forces open the most terrible door of them all..."
Locke & Key has everything I didn't know I was looking for in a comic series: great art (I'm especially fond of the coloring), believable and likable characters (the two can be hard to find in conjunction), and a unique plot that has some complexity to it. Since reading through it the first time I have already gone back and reread it. Locke & Key is a mixture of Fantasy & Horror. Coming from someone who can't watch horror films and slept with the lights on for over a week after once watching The Grudge, the horror aspect wasn't too terrifying. It was more suspenseful than just pure horror. Since this is only the first volume, I can only make comments on how the plot is so far, but those comments are all positive. I'm left intrigued for what's to come. I love the fantasy aspect, and the horror isn't too horrifying that I can't take it. The characters were a major selling point for me. I felt every character was real. A common problem I find in comics is that the characters don't live up to the detailed plot, but that is not the case with this one. In just this volume you get a look into all the main characters and they are beautifully done. 4.5 out of 5 stars. Locke & Key combines dynamic characters in an urban fantasy with notes of suspense and topped off with simple and lovely art. I can't wait to consume the next 5 volumes within the following month. I like keeping my Book Raves short and sweet. When a book is an amazing read, the details are just icing on the cake.